Urban legends have a way of never fading into permanent obscurity no matter how great the effort is to exterminate them. You all know the ones: The faked moon landing, the origins of AIDS, the scuba diver scooped up by the water helicopters and then burned when dumped in a wildfire. My personal favorite has to do with Neil Armstrong and what he may have actually said when he stepped on the moon’s surface, but that, as they say, is another story. – Lee Marvin’s life was saved in WWII by Bob “Captian Kangaroo” Keeshan. 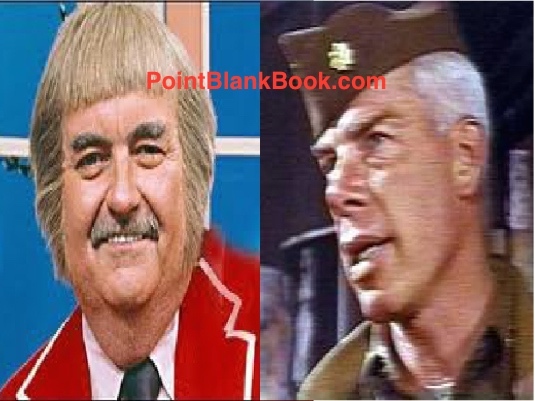 Bob Keeshan, aka Captain Kangaroo (L) and Lee Marvin probably never even met, despite urban legends to the contrary. – James Coburn is Lee Marvin’s brother. – Marvin had his sciatic nerve severed when wounded on Saipan which earned him the Navy Cross. 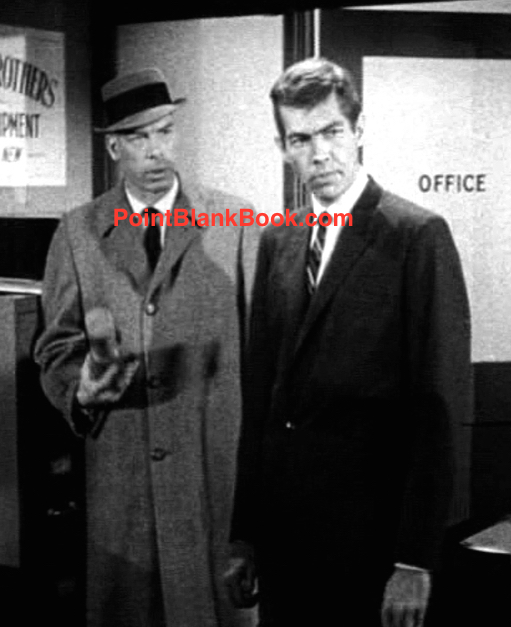 Within the pages of Lee Marvin Point Blank, readers will not find any reference to these myths, for the simple reason that they are not true. Simply denying them is not enough for some folks, which I guess is the reason the website Snopes came into existence. One of the things that keep such rumors alive (or at least believable) is the amount of details they are given to make them seem true. I can’t tell you the amount of people I’ve heard say to me, “I know it’s true about Captain Kangaroo because I saw Marvin tell it on Johnny Carson.” As they say, the devil is in the details. As for James Coburn, well there is indeed a certain resemblance, but that’s as far as it goes. Lee Marvin did have a brother, though, Robert, who bore no resemblance to James Coburn. Lee Marvin & James Coburn looking brotherly on an episode of M SQUAD. 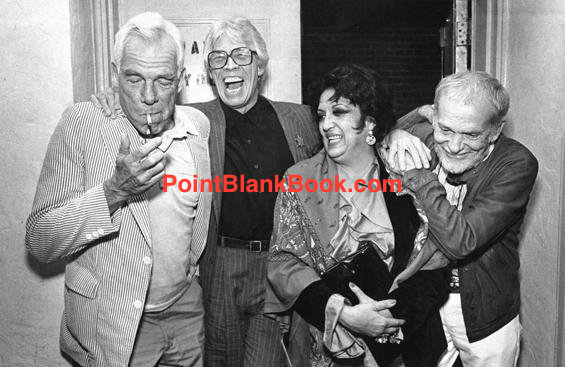 (L-R) Actors Lee Marvin, James Coburn, Katy Jurado and director Sam Peckinpah enjoying themselves in the late 70s. I remember once many years ago being in the great memorabilia shop, Eddie Brandt’s Saturday Matinee, when I overheard an argument about the very same subject. The owner walked over to me to settle it, calling me the resident Lee Marvin expert. A simple shake of my head may have lost somebody a very big bet. As to Marvin’s war wound, that’s harder to disprove as Wikipedia and elsewhere still repeat it. I’ve seen his service record which includes a medical report. His sciatic nerve was NOT severed and he did NOT win the Navy Cross. Purple Heart, yes, but not the Navy Cross. I’m sure such urban legends will continue no matter how great the effort is to squelch them. Instead of wondering whether they’re true or not, I have a better idea. Read Lee Marvin Point Blank. The real story of Lee Marvin is infinitely better than any urban legend. 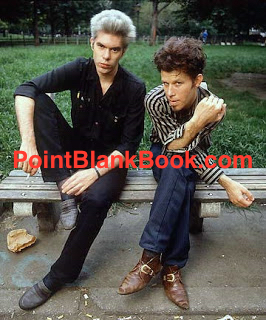 Urban legends aside, in LEE MARVIN POINT TBLANK yours truly DOES write about these two miscreants and get the inside scoop on their “related” lineage to Lee Marvin.